This is my studio for the summer. In January I had the great good fortune to meet a man whose passion for art extends far beyond acquisition. Over the years, he and his wife have quietly and consistently looked for creative ways to provide practical support for working artists. This place, on a hill in the Tarn et Garonne, is one such example: for fifteen years, asking nothing in return, they have invited painters and sculptors that interest them to work here in the summer months. 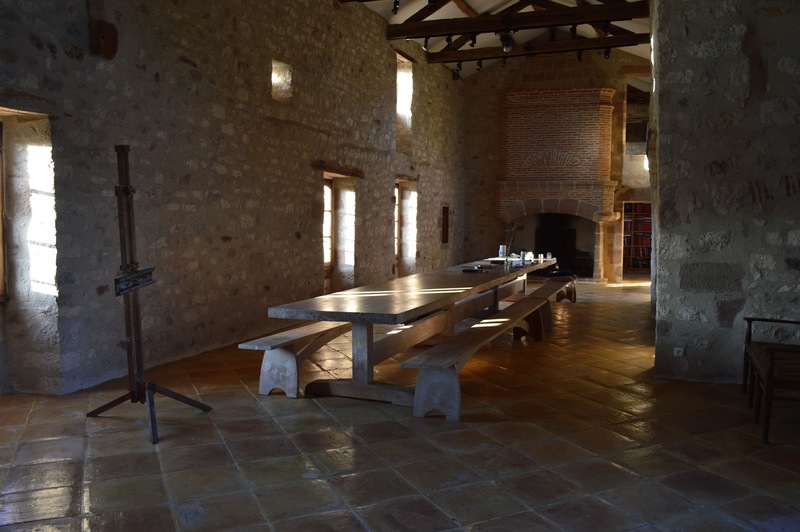 The studio is huge and monastic, the rooms simple and sweet, the courtyard and gardens herb-filled and private. Alongside an ineffable cool stillness, the walls exude a generosity that is hard to describe. I thought I would feel belittled, intimidated by previous, greater incumbents. Instead, like Alice opening doors on the first day, I find a glorious smelling, small ante-room, stuffed with bottles of turpentine, jars of linseed, rolls of paper, fixative, tubes of paint, rolls of paper and even easels – accompanied by pencil notes, wishing future artists well, bidding them use these materials that could not be carried home and to drink the local wine and be well! Stone walls, turpentine and quiet. Deep, deep quiet. Packing in England, I had been full of anxieties: what I would ‘do’ with the time and space? I’d tried very hard to trick myself into thinking I would allow myself a break, “it’s absolutely fine to do nothing…I might just read..etc.” In fact it is such an extraordinary studio that it has been easy to slip into a gentle routine of working for several hours in the morning, reading after lunch and then putting in a few more hours in the afternoon before a walk or perhaps a spin on the Enfield into Cordes for a cold beer in the evening. Home along empty roads that wind through sweet smelling hayfields, under swift-filled skies, past lime trees still humming with bees at ten at night. Then, after a fortnight of such rare solitude and calm, I have a visitor. Last night I went to shut up the studio, only to find a young black-redstart fluttering weakly at one of the higher windows. Distressingly, its parent was flying up and down the glass on the outside. I couldn’t reach him so for half an hour I did my best to shoo him out with a very long piece of dowelling (left by some previous occupant for who knows what,) but he only became more and more distressed. Eventually, worried that my proddings would only cause him to be terminally entangled in one of the thick expanses of cobweb that lurk in the high window reveals, I left him a dish of water, locked up and went to bed. In the morning there he was. Alive at any rate. 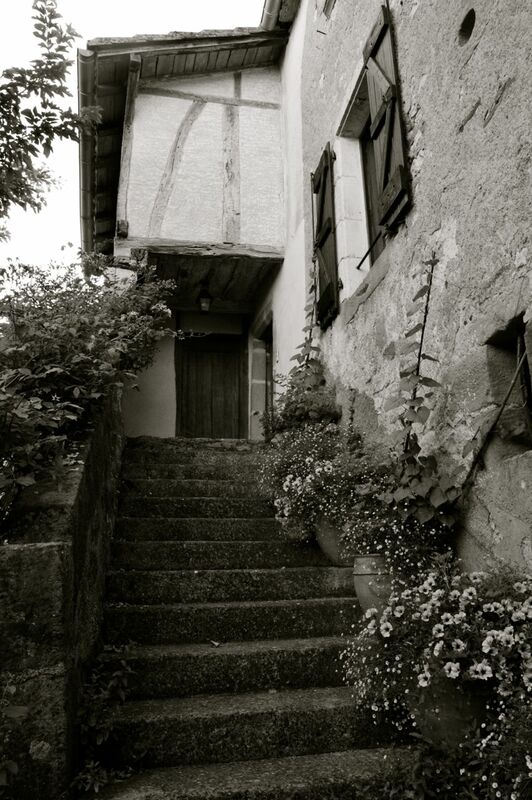 Opening all the windows and door – and, having first swept up all the dead insects and frass that he had kicked down from the beams onto my table in the night – I settled to work. For the first hour he flew the short hops back and forth from one tie-beam to the next, high in the space above me. Then he stayed mostly directly over my head emitting regular high-pitched ‘peeps’. The distress was unmistakable, heartbreaking and impossibly distracting. But – it worked. Suddenly through the largest window, a parent. (A winged parent with beak full of food, so much better than the strange and wingless creature below!) The fledgling changed pitch, vibrated delightedly and was duly fed. The adult redstart flew gracefully around the huge space a few times and then deftly swung out of the same window. The pattern was repeated all morning. 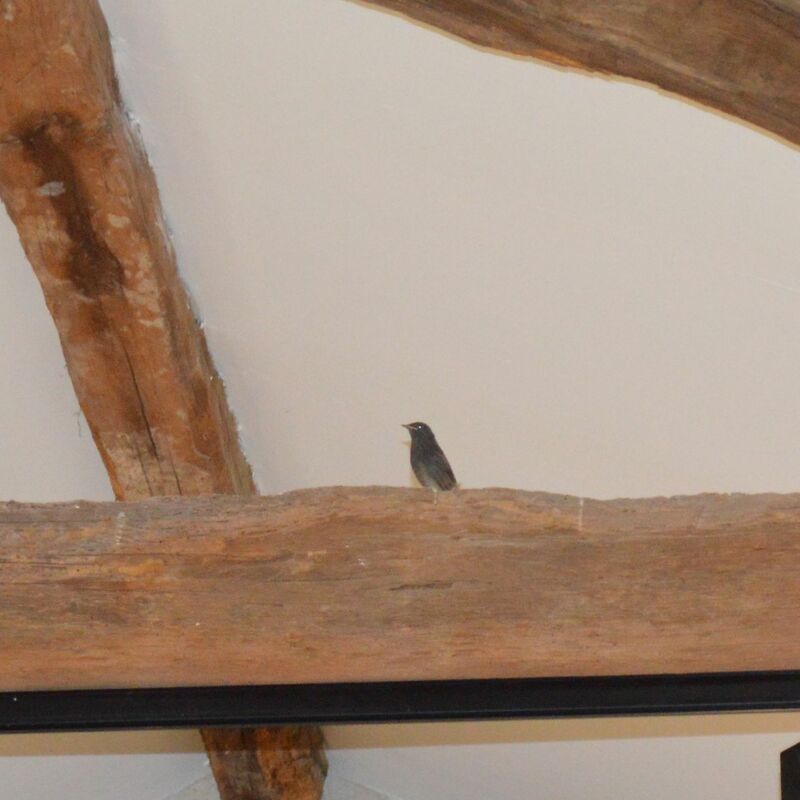 Now the little bird was quiet and just sat in the rafters waiting for his next visit. I think both parents came – about one every twenty minutes – all day. After the first visit they were clearly trying to coax him off the high tie-beam and down out through the window. Repeatedly they flew from the beam, down to a staging post on a ledge, or crack in the rough stone wall, back up to their offspring. Cheep cheep! Vibrate… and then down again and out through the wide open window. The adults had no difficulty doing this whatsoever, elegantly negotiating the beams and cobwebs to drop through the air and swoop back in to the sunshine. The baby was having none of it. He, or she, simply would not follow. Along a metre or two, yes. Up, yes. Out there? No. It was agony to watch. Returning to the studio after lunch, there was the relief of silence. I felt sure from the quiet that he’d worked it out and flown. But no, ten minutes into work on a large mezzotint plate and my heat sank to the unmistakable ‘peep!’ from high in the ceiling. The adults returned, fed, demonstrated the required manoevre, returned, fed and demonstrated all afternoon. (I began to think the baby bird was actually quite happy!) How long will his patient parents keep this up? How long will it take him to mature enough to copy their example and swoop beautifully away? This evening he is still there, as reluctant to leave the studio as I am. Tomorrow is my birthday and the only consolation is knowing that I can do nothing about either his reluctance or mine. The only gift I want, that we are both still alive in the morning.